This 1948 letter sent by HOFer Joe Tinker to Hall President Paul Kerr sold for $4,800 at auction but is believed to have been stolen from the NBL in Cooperstown. The archives of the National Baseball Library are immense and include over 2.5 million items ranging from the 19th century paychecks of ballplayers like Mike “King” Kelly to the day to day correspondence between Hall of Fame officials, ballplayers and ballplayers’ relatives. Over the years Hall of Fame librarians and executives have attempted to track down everything from memorabilia to cemetery plot documents in order to compile player files that contain as much information as possible for researchers and historians to utilize in their work. Whenever an item would come to the library related to a particular player it would undoubtedly end up in that players file for all to see. Napoleon Lajoie’s relatives sent letters regarding the proper pronunciation of his last name; Ty Cobb’s relatives sent in documents about their grandfather’s career as a Georgia politician; Lou Gehrig’s widow sent letters about moving her late husband’s remains to Cooperstown; and lots of Hall of Famers sent thank you notes and requests to Hall of Fame Presidents and officials like Ernest Lanigan, Sid Keener, Bob Quinn, Paul Kerr and Ken Smith. Ty Cobb wrote to Paul Kerr about travel plans for Induction Day while Joe Tinker thanked him for his “beautiful plaque.” “Home Run” Baker apologized for missing an Induction Day due to illness while “Wahoo” Sam Crawford confirmed that he and his wife would arrive in Cooperstown on a Monday before the 1957 Inductions. Most all of the correspondence that was received at the Hall’s New York City and Cooperstown offices was date stamped “RECEIVED” and afterwards made its way into some of the 16,000 general player files housed in the National Baseball Library. Although these documents were placed in the library files by dutiful historians and librarians like Lee Allen and Cliff Kachline, it appears that the only ones remaining in the archives today are the documents with relatively little monetary value. Meanwhile, the more valuable documents featuring the signatures and autographs of Hall of Fame inductees are gone—vanished from the files. Huggins & Scott is offering a 1946 letter sent by HOFer Nap Lajoie to the Hall of Fame requesting postcards (left). A Horner photo of Lajoie was stolen from the HOF library and sold at auction with the HOF ownership marks defaced. Shouldn’t someone at Huggins & Scott have asked, “How did a letter addressed to the Hall of Fame from a Hall of Famer get out of the Hall of Fame?” In other cases shouldn’t auctioneers have asked, “Hey, how could a letter sent to the President of the Hall of Fame regarding Hall of Fame business and date stamped as received by the museum end up in an auction?” Did the auctioneers and authenticator Jimmy Spence of JSA ask these questions before this document was entered into this sale? Apparently not. A letter sent by HOFer "Wahoo" Sam Crawford stamped "Received" by the HOF in 1957 was sold by Mastro in 2006 (left) but appeared first in a 1994 "Mr. Mint" auction. Alan Rosen (top right) sold a group of letters addressed to the HOF including the Nap Lajoie letter in the Huggins & Scott sale. The letter currently up for sale and the others previously sold at auction were not consigned to the sales by the family members of the Hall Presidents and executives, either. In fact, the consignors and sellers of these items can show no provenance whatsoever related to the documents which all appear to have been swiped from the Hall of Fame files at some time in the 1980s as part of a massive heist of Hall history. The main targets of the thefts were the NBL’s August Herrmann Papers archive; Ford Frick and National League Papers; Frederick Long Papers and the internal files of the institution itself. Even player photo files have been looted as evidenced by a $20,000 Nap Lajoie Horner cabinet card that was offered for sale recently by Heritage Auction Galleries until we published an article at Deadspin identifying the stolen artifact. Hall of Famer Ty Cobb was known as a prolific letter writer and the Cooperstown files were once filled with scores of missives sent from the “Georgia Peach” to Paul Kerr and other Hall Presidents including Stephen C. Clark. Cobb letters written to Kerr (some several pages long) have been appearing at major auctions for decades and chronicle Cobb’s travel itineraries for Induction Day, his health problems and his plans to bring his young grandsons to Cooperstown. The Cobb letters sent to Kerr have sold for thousands of dollars at public auctions including Memory Lane, Mastro, Lelands and Hunt Auctions. One of the earliest appearances of a Cobb letter to Kerr appeared as Lot #6 in Mike Gutierrez’ 1996 “World Series Auction” and also included Kerr’s carbon copy letter to Cobb from the Hall of Fame files in the Hall’s New York City office. In 1996 a Ty Cobb letter to HOF President Paul Kerr (along with Kerr's carbon copy answer) was sold by Mike Gutierrez with his own LOA. Ex-Hall of Fame library employee Bill Deane has said in a prior Haulsofshame.com report, “After Tom (Heitz) brought it to the attention of the brass, they said (Gutierrez) is not allowed here.” The ex-Hall of Fame official we spoke with stated that Gutierrez was banned from the National Baseball Library but the Hall refused to file charges or follow through with prosecution. At the time Hall officials had no idea how much material had been stolen from the library, including the letters to Kerr and other officials. In 1994, Alan "Mr. Mint" Rosen sold a small group of documents addressed to the HOF and officials Paul Kerr and Ernest Lanigan. Another large group of twenty letters addressed to Kerr were sold by Richard Galasso Auctions in 1994 including letters written by Tom Yawkey, Billy Evans, Clark Griffith and one lot including twenty letters written to Kerr as Hall president from various MLB team executives and the Commissioner’s office. The letter from Joe Tinker to HOF historian Ernest Lanigan (left) was stamped "Received" at the Hall of Fame offices in 1948 but it sold in a Mr. Mint auction in 1994. Still in the HOF files are many other letters to Lanigan like the one from Hugh Duffy (right). According to the NBL’s ABNER database, the library still retains correspondence sent to Museum officials from Hall of Famers. A 1966 letter to Hall Director Ken Smith from Jackie Robinson shows he was unable to attend an Induction ceremony and a 1947 letter from Clark Griffith to President Stephen C. Clark thanked him for a birthday card. 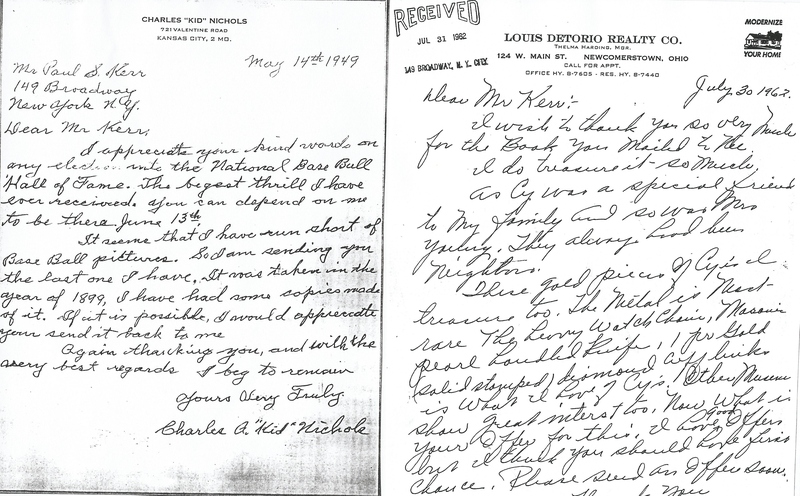 The letter (above, left) written by "Kid" Nichols to HOF President Paul Kerr sold at auction in 1994. The letter to the right is also adressed to Kerr from Cy Young's neighbor offering to sell the HOF Young's jewelry. The letter is stamped "Received" and is currently part of the NBL archive. When Stephen C. Clark died in 1960, Hall secretary and long-time Clark Estates employee, Paul Kerr, was named President and assumed that position until he retired in 1977. Over the years Kerr received correspondence from all sorts of people connected to the game of baseball and others who were related or acquainted with ballplayers and had artifacts or objects the museum desired. 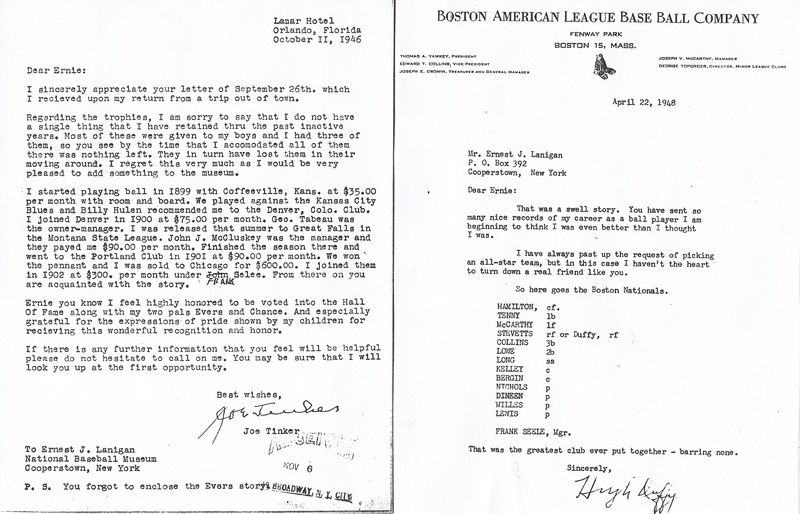 Looking through the general player files in the National Baseball Library there are hundreds of letters addressed to Kerr dealing with everything from acquisitions of artifacts to day to day Hall business. Strangely enough, the more desirable and valuable letters from the Hall of Famers he interacted with, including Ty Cobb, are no longer found in the Cooperstown files. 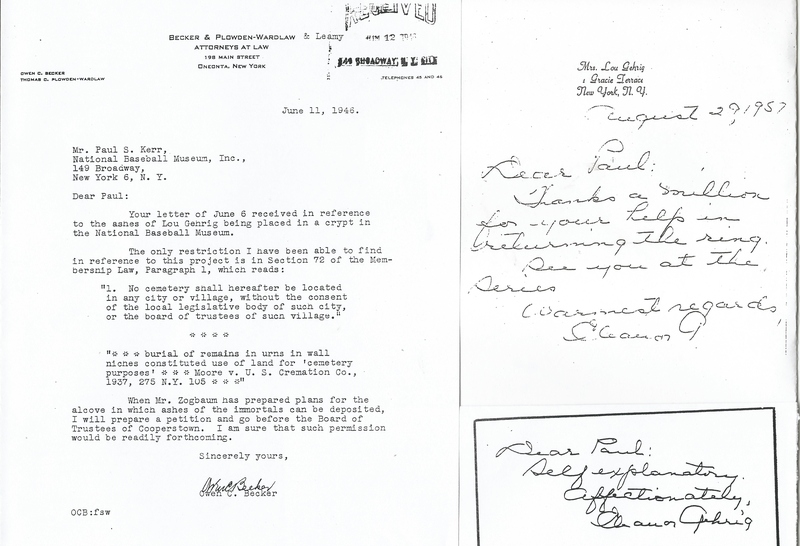 Examples of letters to Kerr still found at the Hall range from offers of Cy Young’s jewelry from one of his neighbors to missives from Lou Gehrig’s widow and her attorney contemplating an offer to actually move Gehrig’s cremated remains from a cemetery to a proposed crypt in the museum at Cooperstown. Added to the growing population of documents which appear to have been stolen from the NBLs Herrmann, Frick, National League and Long collections, the internal documents addressed to the Hall of Fame presidents and officials make the scope of the 1980s heist of the Cooperstown archive even more remarkable. In light of the clear and convincing evidence, the question that must now be asked is what other donated materials outside of these collections have been looted as well? 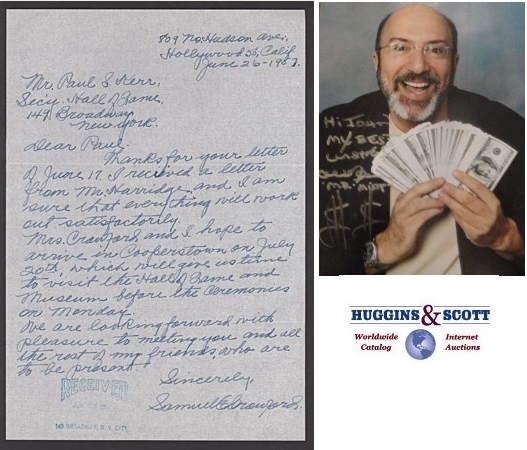 Huggins & Scott VP, Josh Wulkan, says the Lajoie letter he is currently selling came “from an estate of a long time collector who passed away.” This past February the auction house revealed that it was selling the collection of former employee Barry T. Malkin who died in October of 2012. Sources indicate that the Lajoie letter is from Malkin’s collection and that Malkin likely acquired the letter in the 1994 Mr. Mint auction or from a more recent purchaser. Lajoie letters have been known to sell in range of $2,000 to $5,000. When asked how Hall of Fame correspondence ended up in private hands or if he knew of the Hall of Fame selling their internal documents in the past, Wulkan declined to answer. Recently, Wulkan also failed to provide any answers regarding the provenance of two lots in his last auction which appear to have been stolen from the Hall’s Frederick Long Collection. Hall of Fame spokesperson, Brad Horn, declined comment and current Hall President, Jeff Idelson, was unavailable for comment and travelling on business in California. UPDATE (June 14 12:00AM): The Napoleon Lajoie letter suspected to have been stolen from the Baseball Hall of Fame was not withdrawn from the Huggins & Scott auction and sold earlier this evening for a hammer price of $2,100. Earlier today, another Huggins & Scott employee contacted Haulsofshame.com and took issue with the inclusion of the name of the deceased collector identified in our report by sources as the former owner of the Lajoie letter. As of 11am, the bid on the Lajoie letter addressed to the HOF is only 600. Another great article. I don’t see how this continues to happen month after month. Is the HOF not accountable to anyone for letting their property go to auction? Also, Mr. Nash, will you please sign an autograph for me? I’d appreciate it. As of 9:45 PM the bid is moving up at $1,200. and the hammer price is $2,100. John Kerr graduated with honors from Dondero High School in 1958. He earned eight varsity letters participating in baseball and basketball. For his achievements he was awarded the coveted Morrison Trophy in 1958.